Extremely reliable and cool running, the Colt LE6940P is ready to serve soldiers and police alike. Shown with a Trijicon TA31RMR ACOG. The U.S. military’s M4 may soon be on the way out. As reported in Army Times, among other places, vendors bidding to earn the contract replacing the M4 will need to demonstrate “valid reasons” that show “measurable improvement” over currently-issued gear. The M4/M16 is rightly acknowledged as a highly successful platform. 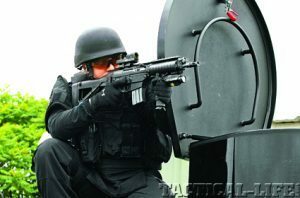 Being the longest-serving rifle in American military history—and one that is on patrol with many law enforcement officers—truly measurable improvement might require a major innovation. Inexpensive and reliable caseless ammunition and a rifle to chamber it, or direct energy weapons, perhaps? The “measurable improvement” we’re likely to see will be a self-loading, piston-driven, gas-operated 5.56mm. 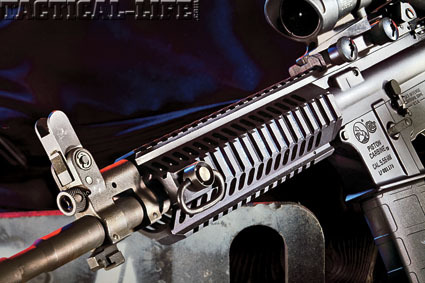 The current M16/AR-15 utilizes direct gas impingement, meaning that gas pressure is forced down a tube directly into the bolt carrier with no intervening piston. The beauty of this system is that it is simple and lightweight. The claimed disadvantage, and a primary listed reason for replacement, is that fouling is deposited directly into the bolt carrier, thus the common complaint that the M16 fouls quickly. All firearms burn propellant and create fouling, which will find its way into the mechanism of any gas-operated system as that gas pressure powers operation. This makes the M16/AR-15 easy to maintain because the area of buildup, directly behind the gas rings on the bolt inside the carrier, can be kept lubricated and the fouling more easily wiped off. Still, any mechanical thing leaves room for improvement. Certainly the most reliable, successful, and longest-serving self-loading weapon designs in history have been piston-driven. Look at the Kalashnikov and FN MAG 58 for starters. Current versions of piston systems claim to offer even more reliability with reduced maintenance, and that is the direction future issued weapons will likely take. In 2010, the Congressional Research Service released a report written by Andrew Feickert that addressed the M4’s design, specifically its shorter gas tube and barrel. Feickert’s suggested modifications, dubbed the M4 Carbine Improvement Program, included replacing the direct gas system with a piston system, strengthening the rail system, and including a heavier barrel for higher rates of fire. At this point, the likely question is not if a general issue piston-driven will be selected to replace the M4, but which one? It should surprise no one that Colt has placed its hat in the ring for this bid. Colt held the production rights to the AR-15 when it was first adopted by the Department of Defense and remains a longtime supplier of small arms to the U.S. military. The company seemed reluctant to get on the piston bandwagon, but they have since produced a few non-DI designs. Their most recent is the LE6940P. The Articulating Link Piston (ALP) operating system is easy to disassemble and maintain, and keeps fouling out of the action. Colt includes a rear backup iron sight that is identical to military issue, and the flattop upper lets operators mount optics. The Colt LE6940P is a modular, piston-operated, lightweight, magazine-fed 5.56mm carbine with a one-piece upper receiver. Colt’s first piston design, the 1020 (M5 Piston Carbine), used the rear portion of the carrier to prevent carrier tilt. 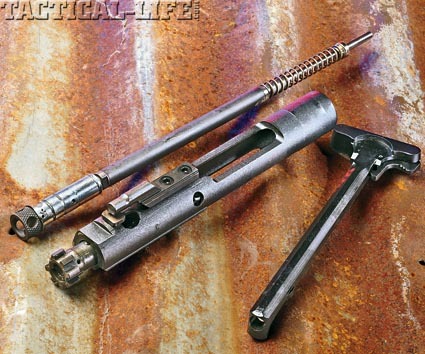 The LE6940P, similar to the Colt’s 1020, incorporates Colt’s Articulating Link Piston (ALP) operating system that reduces the inherent stress in the piston stroke by allowing for deflection and thermal expansion. The ALP is specifically designed for ease of cleaning, disassembly and assembly of parts. In fact, Colt is not new to the piston concept. They fielded a piston-driven AR prototype in the late 1960s as the model 703. Colt’s ALP design is an improvement on gas systems found in their previous M5 and 1020 releases. It’s designed to increase mechanical accuracy while reducing stress on the components during the cycle of operation. Allowing for deflection and thermal expansion reduces inherent stress in the piston stroke, for less wear than that seen in competing piston-driven systems. The ALP consists of a hardened piston sleeve surrounding the piston, which reduces the cyclic rate and reinforces reciprocating parts, thus extending service life. The modified bolt carrier features reinforced carrier rails and a stout contact for the piston where the gas key was previously. Also reinforced is the piston sleeve retaining pin that further reduces wear to the cam pin slot in the upper receiver. Colt redesigned the extractor, making it stronger. The pivot-forward design increases purchase on the rim of the cartridge case. Any change to issue equipment will require re-training. To Colt’s credit, this will be very minimal with the LE6940P. The only change is in operator maintenance, as there are additional parts— the piston system—that need to be removed for cleaning. The ALP is held by a single, self-captive retaining pin that works just like the pins securing the upper and lower receivers. 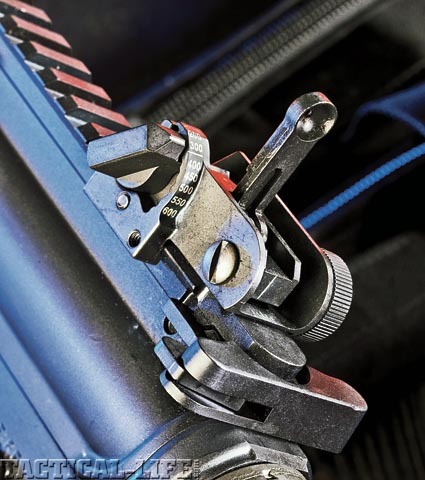 Pressing the retaining pin allows the entire ALP gas system to slide out through the front of the front sight base. The piston and piston sleeve pull easily apart and are cleaned just like the gas ring area of the bolt and bolt carrier in a standard AR-15. Thankfully, cleaning these additional parts is offset by a bolt that is now carbon free. With all the gas fouling and carbon contained in the ALP piston and sleeve, the bolt and carrier receive none. Reassembly is just as simple and the parts are machined to make backwards or upside down reinstallation impossible. Measuring 35.5 inches with the stock extended and weighing 6.9 pounds, Colt’s LE6940P has the same svelte trim of the M4 it might ultimately replace. The one-piece monolithic upper is a rock-solid platform for mounting optics, eliminating any possibility of external pressure from influencing point of impact shifts, and the Bill Rogers-designed Super-Stoc gives fixed-stock rigidity. Colt also incorporated a nice flip-up front sight, allowing it to get out of the way when using an optical sight as primary, and includes a current-issue backup iron sight. 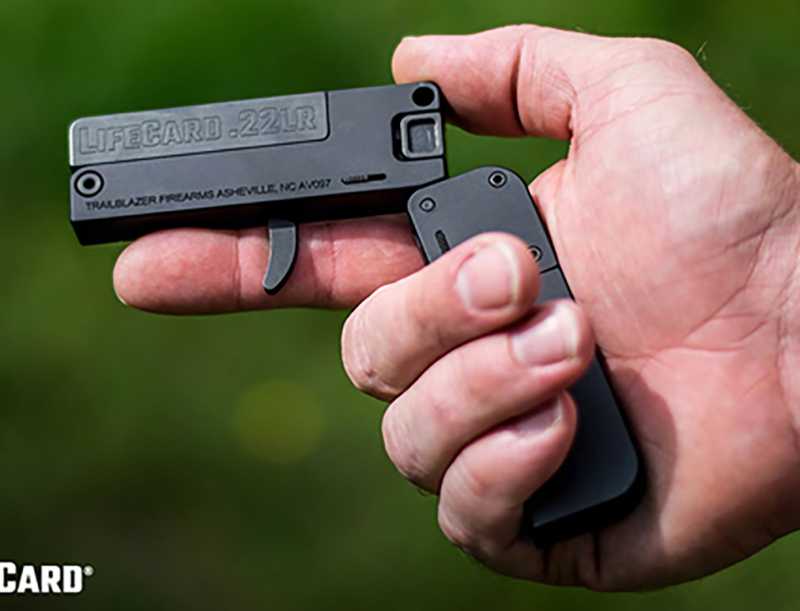 The quad-rail forend provides plenty of space for mounting accessories. Note the sling attachment point on the left side. So, how did it shoot? One potential problem with accuracy in piston-driven systems is that the collection of “inter-smashing” parts has to be tuned for a consistent lockup. While it may be a long time before we see an ALP-based Service Rifle on the line at Camp Perry, the LE6940P wants to shoot well. I mounted an Insight MRDS (Mini Red Dot Sight) and used NRA B6 targets for accuracy testing. The MRDS dot fits perfectly inside the 5.5-inch bullseye at 100 yards. 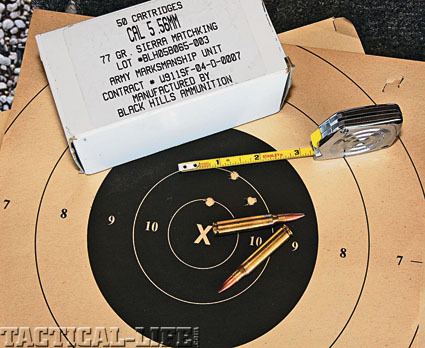 I also used issue ammo, choosing M855 ball (green tip), M193 ball and a load from Black Hills with 77-grain Sierra MatchKings used by Army shooting teams for Service Rifle on the short lines. The LE6940P digested all three issue loads without a hiccup. Averaging 1.4-MOA groups with three kinds of ball ammo, two of which aren’t known for precision, is more than good enough for a field rifle and is better than the M16A2 I used to win the rifle match at All Army a few years ago. 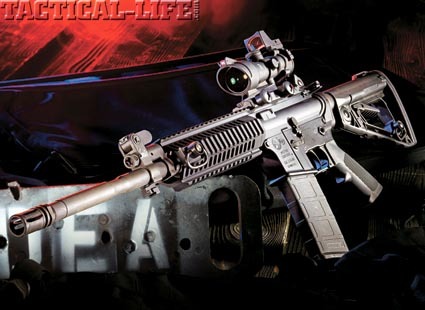 It is outstanding for a red-dot-sighted carbine intended for close-quarters combat. Few soldiers, Marines or tactical shooters have the skill to benefit from anything better. Working it over on some 3-Gun speed shoots was equally pleasing. Despite using a variety of magazines (some issue, some not) and three types of ammo, I didn’t experience a single stoppage. The upper did a good job dissipating heat and only became noticeably warm after several magazines. It isn’t likely that the Department of Defense will abandon the longest-serving service rifle just to make minor product improvements. And if the military uses it, police agencies are sure to follow suit. In that light, the Colt LE6940P makes sense. It is a design instantly familiar to anyone serving in the U.S. armed forces from the 1970s until now, especially those soldiers returning home to become officers, with an operating system that should only enhance reliability. Until electronically fired caseless ammunition and the rifles that fire it become affordable and reliable, we will likely continue using something similar to the AR-15. Eugene Stoner’s masterpiece may be six decades old, but it works and has only improved with age. If a piston-driven system really will improve reliability, Colt’s LE6940P fits the bill.